One of the pleasures of living here is playing a variety of games. We brought a number with us, but we’re always looking for new and challenging games. 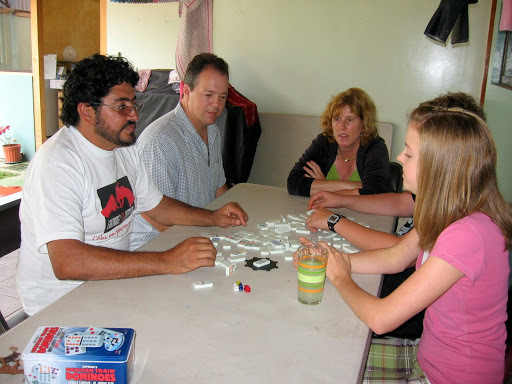 Our friend Eduardo brought over a game called “Mexican Train Dominoes” and it was fun for the entire family. A nice way to spend a weekend afternoon in the shade. This is also a good way for us to reconnect as a family and enjoy our friends who come over to visit with us. Relationships are key in Latin America. We have to be ready at a moment’s notice to serve coffee and snacks. Of course, we also have to be willing to drop what we’re doing at the time and focus on the people who have come to visit. This is where real relationship occurs, and it is a privilege we have taken to with great joy.